Each day that goes by it seems like I love my kids more than the day before. 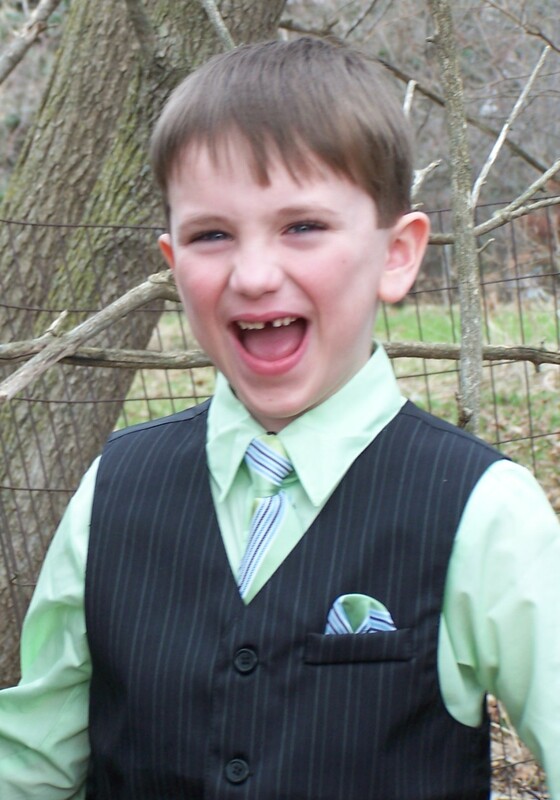 In August 2012 Caleb was diagnosed with Sensory Processing Disorder (SPD), just before he started kindergarten. He has been getting occupational therapy (OT) ever since. OT has helped him SO much! Before OT he couldn’t get a hair cut or get his nails cut without us holding him down and him screaming and crying like you’ve never seen! Now, he sits in the chair to get his hair cut ALL BY HIMSELF and even lets her use the clippers! Nail cutting is still tough, but is LEAPS AND BOUNDS better than it used to be! We now have tools to help his body to regulate better. But, there were still many issues that Caleb was struggling with both at home and at school. He does very well at school with the tools he has, but because he works so hard to hold it together at school, he lets loose at home and has a difficult time. There are many things about SPD that can overlap with Autism (ASD) symptoms. There was just something in my “mommy gut” that said SPD wasn’t addressing all of Caleb’s issues. He was still struggling and I wanted to figure out why and what we could do to help him. No loving parent wants to see their precious child struggle when they don’t have to! We decided to get him tested for ASD. I was really on the fence whether or not he had it, but it was the next step. And after this testing I could know for sure either way. After the testing we were told he is NOT Autistic. He has some indicators, but not enough to qualify for that diagnosis. I finally had a definitive answer about ASD. But, then why is he still having so many struggles? Well, that answer came from the ASD testing. Caleb has Tourette Syndrome (TS) and Attention Deficit Hyperactivity Disorder (ADHD). I still have a lot of research to do to educate myself about TS, but after hearing the professionals explain what TS is and how it affects my sweet boy, it made so much sense! Caleb has been having tics for at least 1.5 years but I didn’t always know what they were. They have been getting worse and worse – some to the point that they are hurting him now. I thought TS was just tics. But that’s not all. TS affects focus, emotional regulation, impulse control, and many other things – all of which Caleb has huge struggles with. The ADHD affects his hyperactivity, focus, impulse control, etc. I feel very mixed about all this. I am SO relieved to have some answers now. We have a better understanding why he does what he does and are now able to pursue how to HELP him with this. But my heart still hurts hearing what is happening inside his little body, how his brain is misfiring and seeing the affects through his tics, his behavior, etc. He is such an AMAZING, loving, sweet, sensitive, special kid….but that gets covered up. He has been feeling bad about himself, believing he’s a “bad kid”, saying that we “hate him” when he misbehaves, that he will “never be a good kid”….all things that break my heart into a million pieces! No 6 year old should feel like that about himself! NO CHILD should feel like that! So now I start the journey of learning more about these conditions and ways to treat them. I also need to deal with the grief about this news. I just don’t want my sweet little ones to struggle or suffer at all. I know, in my head, that we ALL struggle, that I cannot protect my babies from everything in the world. But, gosh, I sure wish I could!! None of these diagnoses change who my precious Caleb is, nor does it change my love for him. It WILL help me better parent him and help him to thrive and grow into the amazing man God has created him to be! I'm glad you stopped by and hope you enjoy your visit! I am a wife, mom and follower of Jesus. I write from the heart, the good and the bad. I don't sugar coat things. I don't see how that really does much good. Life has taken some sharp (and sometimes painful) turns lately, so that is much of what I write about. I hope you enjoy your visit and would love to hear from you!